The medial collateral ligament, or deltoid ligament, demonstrates some variability in composition [35,36]. Principal fibers of the superficial deltoid include tibiospring, tibionavicular, tibiocalcaneal, and superficial posterior tibiotalar ligaments [35-37]. In one anatomic study, only the tibiospring and tibionavicular ligaments were present in all ankles . The deep component of the deltoid includes the anterior tibiotalar and deep posterior tibiotalar ligaments [35,36]. 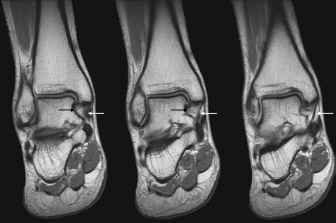 Similar to the posterior talofibular ligament, the deep deltoid ligament demonstrates an inhomogeneous appearance at MRI, which correlates at anatomic dissection with normal fat between ligament fibers (Fig. 14) . Deltoid ligament injury is present in 10% to 36% of patients with ankle fractures [38,39]. Similar to other ligaments , MRI manifestation of deltoid ligament injury is seen as increased signal intensity, partial or complete disruption, or a wavy appearance of the fibers (Fig. 15). Avulsion fractures may occur from the medial malleolus or talus. Some authors conclude that surgical reconstruction of the deltoid ligament is unnecessary for stability of the ankle [40,41]. When surgery is performed for medial ankle instability, it may involve reconstruction of the medial ligaments and, if necessary, the lateral ligaments, and in cases of progressive deformity or prolonged valgus alignment, may include cal-caneal osteotomy . Fig. 14. 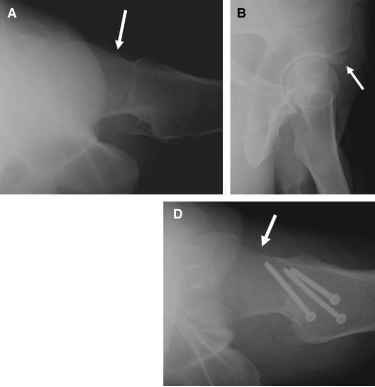 Coronal FSE images demonstrate the normal appearance of the deep (black arrows) and superficial (white arrows) components of the deltoid ligament. Fig. 15. Coronal FSE image demonstrates increased signal intensity and discontinuity of both deep (black arrow) and superficial (white arrow) components of the deltoid ligament.